The United States Gypsum Company invented drywall, and Sheetrock is that company's brand name for the paper-coated gypsum product. Installing whole sheets on open wall surfaces is a straightforward procedure, but when it comes to having to cut pieces to fit and installing pieces near window or door frames, things can get tricky. You could hire a professional to do the job for you, but you can do this project yourself and still achieve professional results if you have the right supplies. Drywall is America's number one interior wall covering. Hang all of the whole sheets of drywall on the wall, starting on one end and working your way in toward the window, on each side. Hang drywall on all other walls in the room. 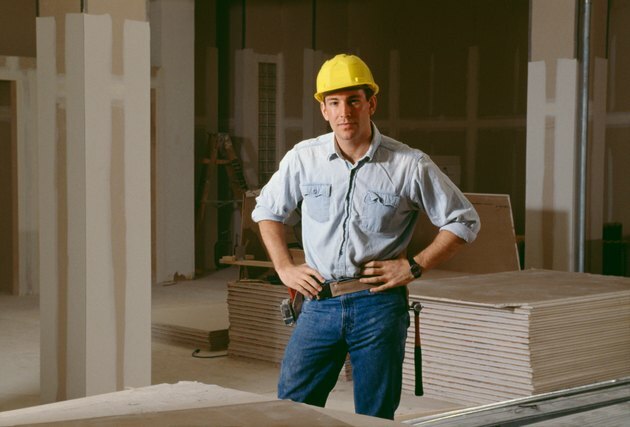 Install drywall by holding it in place on the wall and inserting screws through it and into the studs using a cordless drill and 1 1/2-inch drywall screws. Measure the space on the left side of the window. Measure the space on the right side of the window. Find the length and the width of each side. Lay a sheet of drywall face down on a flat surface. Use a tape measure, marking pencil and a straight edge to measure and mark the piece according to the measurements for each side of the window. Run the marking pencil along the straight edge several times to ensure a clear, dark cut line. Use wooden blocks to prop the drywall up 2 inches so that you can cut it. Cut the drywall to size with a utility knife. Use the knife knife to clean up any burrs on the edges. Hold the piece in place on the wall, with the edge snug against the edge of the window frame. Secure the material to the wall by inserting 1 1/2-inch screws through the drywall into the framing behind it. Cut a piece of self-sticking drywall tape to the length of the window frame. Apply the tape to the first side of the window frame. Do the same for the other side. Press the tape's center into the corner of the edge of the drywall and the window frame. Run your finger tip down the entire edge on each side to push and press the tape into the corner. Fill a trough with all-purpose drywall joint compound -- also called mud. Use a straight drywall knife to cover the seams on each side of the window frame. Run a corner knife down each side. Allow the mud to dry for one hour. Apply a second coat in the same way. Allow the second coat to dry for 4 to 6 hours and apply a third coat, if necessary. Sand the final coat lightly with 120-grit sandpaper.